Yarmouth Boys Basketball hadn't played in a regional final since 1974. All that stood in their way from making it this year was top-seeded Greely. The Clippers were up to the task, pulling away in the fourth quarter and upsetting the Rangers 54-42. Yarmouth got off to a good start, leading 4-0 early. Bailey Train would rally Greely back with three 3-pointers in the first quarter, as the Rangers led 12-8 after eight minutes. The teams traded baskets and free throws in the second quarter. Yarmouth would make 7 free throws as a team, and Greely's Sam Johnston and Yarmouth's Luke Pierce would score 10 points a piece in the first half. Greely headed into halftime with a 22-19 lead. Liam Maker would extend Greely's lead with two early baskets to start the second half. 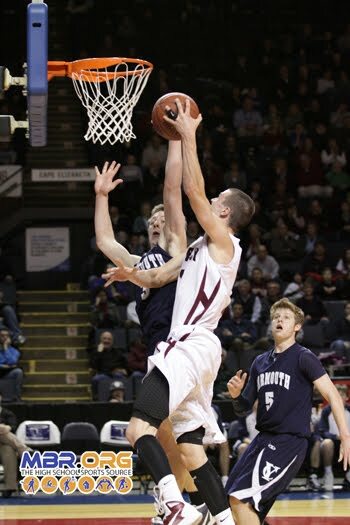 Yarmouth would battle back as Pierce scored 8 points and the Clipper defense held Greely to just four field goals. Connor Ertz made a layup at the buzzer, and it was Yarmouth with a 32-31 lead heading into the fourth quarter. The Clippers would then score the first six points of the fourth, as Josh Britten had 4 points and Pierce chipped in with a basket. Greely wouldn't score for the first 3:29 of the quarter, until Michael McDevitt hit 2 free throws. Yarmouth then made their free throws to pull away. Britten, Chris Knaub, and Matt Murphy would combine to make 12 free throws in the fourth quarter. The Clippers now move on to the Class B West Final on Saturday; a game that is 36 years in the making.